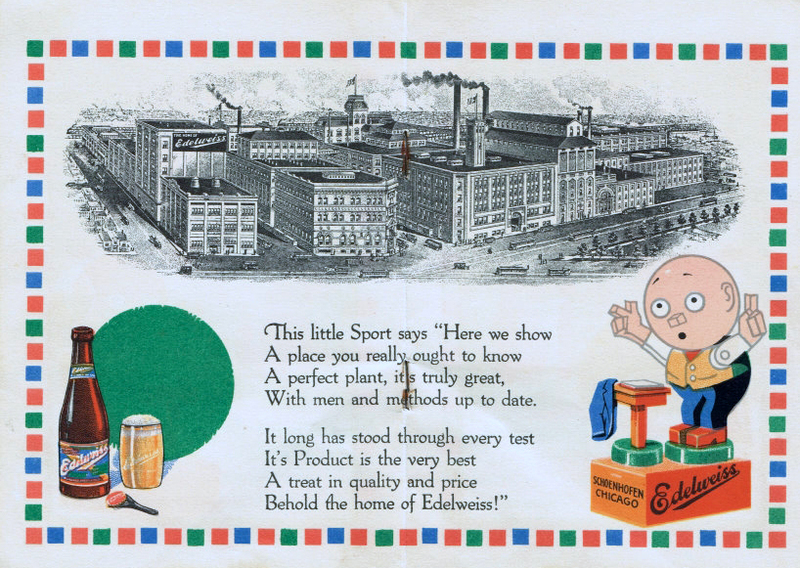 Perhaps the most notable advertising campaign of Specialty Advertising is the one that is now being conducted by the Schoenhofen Co. of Chicago to advertise Edelweiss. The basis of this notable campaign is the “Toy Boy” originated and developed by the Ostenrieder Advertising Agency of Chicago. “Toy Boy” is the name applied to a series of twenty or more pleasantly humorous characters designed in the style of the brightly colored wooden toys that are associated with Noah’s Ark of our child hood days. 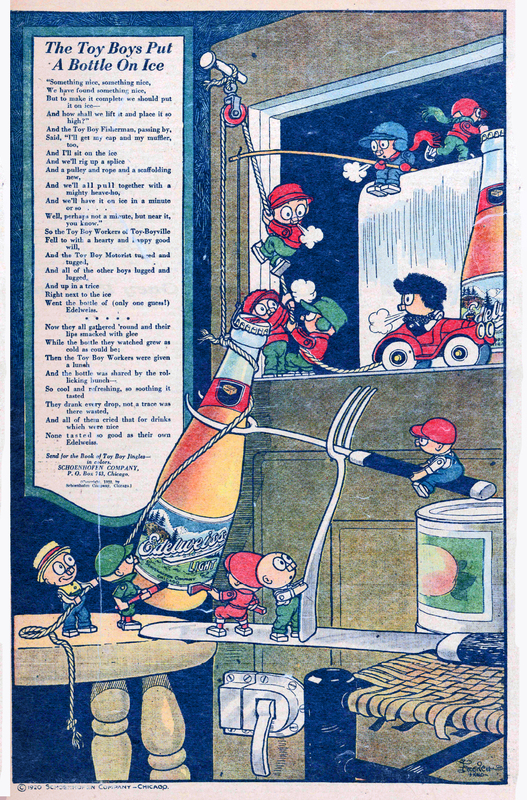 1920 advertisement for the Schoenhofen Company shows the Toy Boys attempting to put a bottle of Edelweiss Light beer on ice. These figures, of which there are some twenty. typify various popular outdoor and indoor sports including golf, billiards, tennis, fishing, motoring etc. They average about 27 inches in height and are die-cut from cardboard of such thickness as to prevent bending or breaking. On the back of each is an easel device that enables the “Boy” to stand alone. The figures are finished in the brightest of colors—red, green, yellow and blue predominating. The “Toy Boy” has been a decided advertising hit. He is a long range attention getter and has played a big part in making Edelweiss popular over a wide territory. Aside from the cut-outs, which can be used in show windows or any place in the store, these characters appear in practically all of the Schoenhofen Co. advertising. They are used in newspaper ads, billboards, wall signs, and all of the many other mediums employed by this company. They are inseparably associated with Edelweiss and are now so well known that they would accomplish their purpose without the name of the beverage appearing. The Schoenhofen Co. also issues a booklet showing all of the “Toy Boy” characters. It is handsomely printed in full color by the offset lithographic process and each page is devoted to a character with a jingle indicating the advantage of using Edelweiss as a beverage. 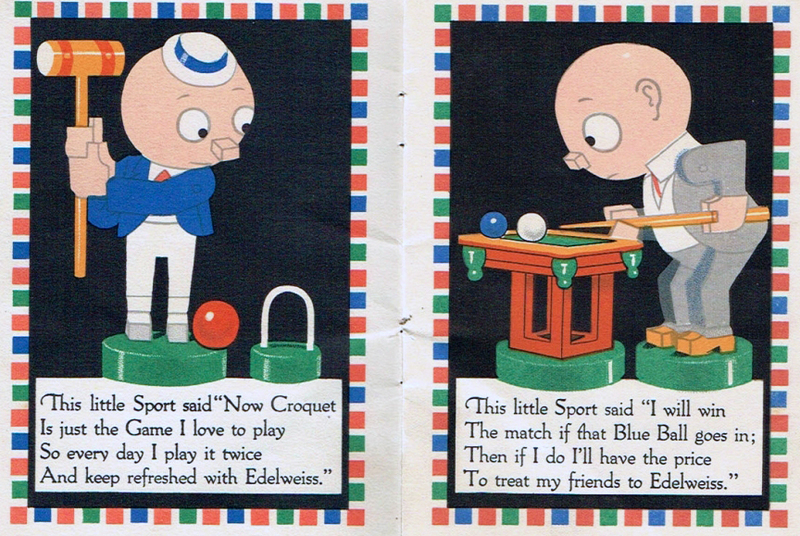 This booklet, which is called “The Funny Little Sports,” has been issued in large editions. It has proved wonder fully popular, not only with children but grown persons as well. A cardboard fan showing the Edelweiss “Toy Boys” has also proved popular. Here are some more of the entertaining little Toy Boys that are now used in practically all of the advertising of the Schoenhofen Co. They are used in newspaper ads., on the billboards and in many other ways. This series was originated by the Ostenrieder Advertising Corporation of Chicago. Few ad. campaigns have won so much attention as this.